You love your pets, but the people checking out your house in the hope of buying it may not share your ardor. The mere sight of these furry creatures can tip the scales, for some buyers, against making an offer on your property at all. Perhaps you only want animal lovers to inherit your home—but if you’re a come-one-come-all kind of home seller, you may want to try to avoid the seven deadly home-sale saboteurs that are listed below. We’ll show you how. Just when you think you’ve got it all vacuumed up, you spot drifts of fur under tables and stuck to upholstery. “A lightly dampened sponge is perfect for removing pet hair on furniture and fabric,” says Danessa Itaya, vice president of Maid Right, a home-cleaning service. Alternatively, you can try lint rollers and squeegees, adds Nancy Jones, an interior decorator with Showhomes, a home-staging company. “We also use pet hair gloves that are designed specifically for cleaning up fur,” Jones says. You should also get in the habit of brushing your pet regularly—and doing this outside. Apply a minivacuum directly to his coat, as shown below. Really. If your feline likes to cough up grass clippings in the hall or pee under the basement workbench, a potential buyer will likely note the discoloration and either wince or run (or perhaps wince, then run). Carpet and floor stains need to be fixed before any showings. If you can swing it, replace the rug, or at least roll it up and stash it in the garage. Hire a flooring professional to remove tougher stains, either by sanding and re-staining a wood floor or dealing them with a commercial-grade cleanser. You’re so accustomed to—and in love with—your pet that you no longer realize she’s given your home a certain scent … but rest assured, visitors will pick up on it as soon as they set foot through your front door. In some cases, before they set foot through the door. The remedy? Good ol’ baking soda, which is safe and effective, says Itaya. “You can sprinkle it in your cat’s litter box as a deodorizer or put a small amount in a spray bottle with water to apply to your pet’s favorite hiding spots,” she says. And if the smells haven’t been absorbed by the carpet padding, they can generally be lifted out with a pet enzyme removal product or Resolve, notes Jones. “There are also many candles and air fresheners that can eliminate odors without overpowering,” she says. 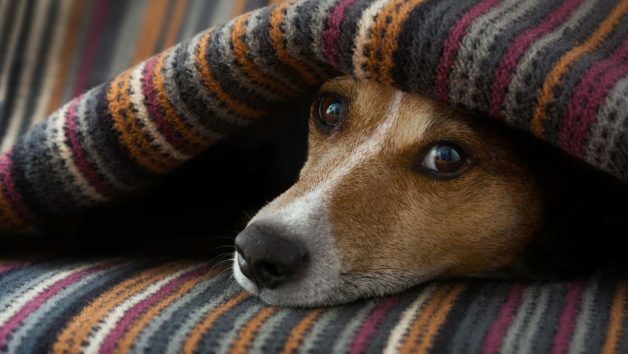 Cats may have some leeway to nap on the bed, but the very presence of a dog on the couch or bed may scare some people off, often for good reason. When you’re getting ready for a showing, be sure your pooch is out of the bedrooms and either housed in his crate or shipped off to a friend or doggy day care for the afternoon. Then make sure there’s no telltale pet hair left behind. Puppies will chew on just about anything, including chair legs, baseboards, and other wooden features in your home. If you see significant furniture damage, remove the pieces and store them during your next open house. But smaller marks can be hidden with a couple of DIY solutions. “Felt-tip markers can make a world of difference on scratched-up furniture—find one that matches the color of the wood, and you’ll quickly transform dings so they’re less noticeable,” says Itaya. Jones likes Old English furniture polish to clean up pet scratches. “It now comes in both light and dark versions and covers most surface marks,” she reports. To remove a deep scratch, use wood putty to fill in the grooves and follow up with a stain to match. You won’t impress a potential buyer if he or she has to dodge your pet’s toys in order to get inside the door. Remove these hazards by gathering up her chew things and placing them in a nice-looking basket or bin. You should also hang up your pup’s tangled pile of leashes, fold and straighten her outfits and jackets if she has any, and stash pet beds until the showing is over. Water dishes and pet food bowls are easily knocked over, so be sure to dump them out and load them in the dishwasher before an open house begins. Of course, you’ll scoop out the cat box so that it’s as clean as possible, but it’s better to get rid of it entirely. Not only does it smell, but it’s just plain gross to catch sight of that gravelly stuff. “If you must have a litter box around, I usually suggest the clumping kind [of litter] because it’s easier to clean,” Jones recommends. And if your visitors are coming with pets, be sure to spray neutralizers on the areas where they migrate, to prevent dogs or cats from marking their territory.